During a wine tasting in the Willamette Valley you may be told whether or not the wine went through a “secondary fermentation.” If you’ve ever wondered what this means, here is my exploration of the science behind malolactic fermentation: from the vineyard to the bottle. Winemakers use a bacterial process, “secondary fermentation,” to convert malic acid to the softer smoother yogurty lactic-acids. 1. Waiting to perfect ripeness is risky. Many fruits, including grapes, are acid-tart until they ripen. How many times have you picked a grape or raspberry only to find it’s not quite ripe yet? Waiting for Oregon pinot noir grapes to ripen to the perfect sweetness is risky. a. 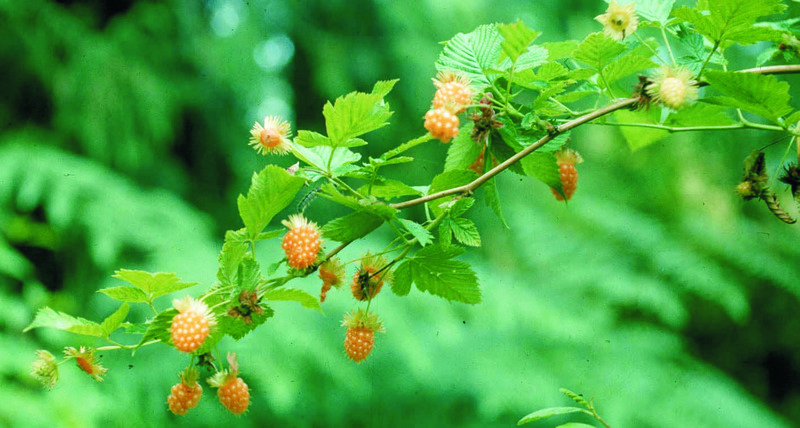 The berries could shrivel and dry before they become perfectly ripe. As sugars in the grapes increase, the “pipes” that transport water and minerals through the plant become leaky. This, combined with pinot noir’s thin skins mean that the berries can lose moisture quickly. b. Sweeter berries are more tempting to birds. c. Our rainy falls can damage grapes and encourage fungal infections. There are several acids in grapes, but for Oregon pinot noir, the majority (as much as 90%) of the acid is tartaric and malic acids. a. Tartaric acid is more abundant than malic acid. A strong-ish acid, it controls the acidity of wine and its presence helps to make keep bacteria from spoiling the wine. b. Malic acid levels peak in the fruit just before the vines start to change color. Then, as the grapes become change from green to purple, malic acid levels drop. Malate (in my world, I think of malate and malic acid as synonyms) is an intermediate in several fundamental cellular metabolic pathways. Most commonly, cells, including your own, make and use malic acid so that the levels stay about the same. When grapes ripen, the amount of malic acid inside drops naturally. The causes are both environmental (farm practices and weather) as well as genetic (which kind of grape). I did some research and found the following tidbits about the levels of malic acid in ripening grapes. Malic acid quantity in grape cells goes up and down via several biochemical pathways; it’s not a simple thing. Changes in season and farming practices have impacts on malic acid levels. Genetic causes in malic acid levels have to do with they types of grapes. The plant hormone ethylene triggers genes to make an enzyme that makes malate. Many of the recent findings associated with malate and fruit ripening were possible through genetically engineering plants. One study using GMO tomatoes associated malate with several characteristics of fruit ripening. We still have much of the biochemistry, genetic controls, etc., to figure out. Even though overall the levels of sugar are increasing in the ripening fruit, the amount available for fuel is actually decreasing. As grapes ripen, sugars are stored away in packages that are off-limits to the grape. And the “pipes” that transfer sugars from the leaves to the fruits are getting leaky. “Hungry” grape cells start using up malic acid, an intermediate in the process by which all cells fuel their activities. California grapes can use up nearly 1/2 of their malic acid by time of harvest; in cooler Oregon, the drop in malic acid is less pronounced. So we’re left with Oregon grapes that have too much malic acid. Secondary fermentation to the rescue! 3. “Secondary Fermentation” isn’t really fermentation. There are at least 4 main groups (genera) of bacteria that convert malic acid to lactic acid. They live naturally on the plants, in wine barrels, and in the air. Needing to learn more about the biochemistry I pried open my biochemistry text from college. Not finding what I was looking for, I turned to online research. I created the following drawing from a variety of research articles. My goal was to understand the metabolic benefit of this conversion for a bacteria. The big purple circle represents the bacterial cell. The 3 blobs that are on the surface represent channels that cross the bacterial cell wall and serve as gateways for chemicals to pass in and out of the cell. Start with the malic acid in the grape must outside of the bacterial cell (upper left in my diagram). 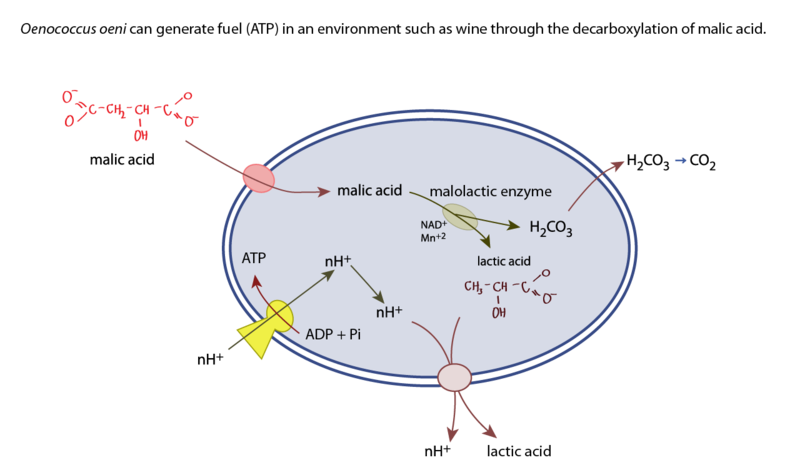 A protein (pink in my diagram) that spans the cell membrane transports the malic acid from outside the cell (in the grape must) into the bacterial cell. Think of it as a turn-style that only allows a certain group of chemicals through. This turn style allows malic acid in. And keeps protons (H+) out. Once inside, a second enzyme converts the malic acid to lactic acid and H2CO3. Technically, even though this process if often called “secondary fermentation” it’s not a fermentation. It’s a decarboyxlation – malate loses a carbon dioxide. Lactic acid, H2Co3 and one H+ are expelled from inside the cell. The only way H+ can flow back in is through a special transporter, an enzyme, that spans the cell wall. This enzyme is similar to turbines in a dam. It harnesses the energy of the flow of H+. For every 3 protons that flow through the membrane back into the cell, 1 ATP (think of it as a unit of biochemical energy) is produced. In summary, for each molecule of malic acid that has been converted to lactic acid, there is a loss of one CO2, a decrease in acidity, and the production of energy that can be used by the cell. If you look at the drawing below, you see why lactic acid (only one proton to contribute to acidity) is less acidic than malic. The actual changes in acidity will depend on how acidic the wine was to begin with, the initial concentration of malic acid, and the buffering capacity of the initial wine itself. Because carbon dioxide is being produced, a winemaker can tell the process is still going on by listening to the barrel — there will be a slow and persistent “pop” of the gas. Eventually, all of the malic acid in the wine should convert to lactic acid. In general, the winemakers of Oregon want to convert all of the malic acid to lactic acid by means of these bacteria. This can happen naturally – bacteria are present on the grapes themselves, in the barrels, etc. and can be encouraged by creating an environment conducive to the process. Racking pours off skins which contain essential nutrients for the yeast and bacteria. Other winemakers in the Willamette/Yamhill Valleys believe that adding bacteria themselves gives them more control over the final product. First, because the wine is less acidic, it will taste softer, or smoother. Second, these bacteria can remove other compounds and/or create new flavors. Many of these new chemicals have names that bring back memories of organic chemistry. The bottom line is that whether or not they are produced depends on a whole host of variables, not the least of which is the strain(s) of bacteria present. Also, different conditions in the fermenting wine will encourage different biochemical processes. Finally, winemakers have long believed that MLF leads to an increase in microbial stability. The bacteria use up any nutrients that other (bad) bacteria could use. The bottom line is that when it comes to malolactic fermentation and what it adds to pinot noir, there are a lot of variables. Most importantly, it’s the techniques and decisions of the winemaker in addition to things outside of her control, such as the weather that year and bacterial strains which may be present on the grapes naturally. Bauer, R., and L. M. T. Dicks. “Control of Malolactic Fermentation in Wine. A Review.” South African Journal of Enology and Viticulture 25.2 (2004): 74-88. Centeno, D. C., S. Osorio, A. Nunes-Nesi, A. L. F. Bertolo, R. T. Carneiro, W. L. Araujo, M.-C. Steinhauser, J. Michalska, J. Rohrmann, P. Geigenberger, S. N. Oliver, M. Stitt, F. Carrari, J. K. C. Rose, and A. R. Fernie. “Malate Plays a Crucial Role in Starch Metabolism, Ripening, and Soluble Solid Content of Tomato Fruit and Affects Postharvest Softening.” The Plant Cell Online 23.1 (2011): 162-84. Web. 29 Oct. 2014. Etienne, A., M. Genard, P. Lobit, D. Mbeguie-A-Mbeguie, and C. Bugaud. “What Controls Fleshy Fruit Acidity? A Review of Malate and Citrate Accumulation in Fruit Cells.” Journal of Experimental Botany 64.6 (2013): 1451-469. Web. 29 Oct. 2014. Famiani, Franco, Daniela Farinelli, Alberto Palliotti, Stefano Moscatello, Alberto Battistelli, and Robert P. Walker. “Is Stored Malate the Quantitatively Most Important Substrate Utilised by Respiration and Ethanolic Fermentation in Grape Berry Pericarp during Ripening?” Plant Physiology and Biochemistry 76 (2014): 52-57. Web. 29 Oct. 2014. Goode, Jamie. “Carbonic Maceration: A Closer Look at This Winemaking Technique.” http://www.wineanorak.com/winescience/carbonic_maceration.htm Web. 29 Oct. 2014. Malolactic Fermentation in Wine Understanding the Science and the Practice. (2005): Http://www.lallemandwine.com/IMG/pdf_LALLEMAND_MLF_IN_WINE.pdf Web. 29 Oct. 2014. Poolman, B., D. Molenaar , E. J. Smid., T. Ubbink, T. Abee, P. P. Renault and W. N. Konings. “Malolactic Fermentation: Electrogenic Malate Uptake and Malate/lactate Antiport Generate Metabolic Energy.” Journal of Bacteriology 173.19 (1991): 6030-037. Pua, E.-C. “Malate Synthase Gene Expression during Fruit Ripening of Cavendish Banana (Musa Acuminata Cv. Williams).” Journal of Experimental Botany 54.381 (2003): 309-16. Web. 29 Oct. 2014. Ruffner, Hans P., Seusanne Brem, and Dora M. Rast. “Pathways of Photosynthetic Malate Formation in Vitis Vinifera.” Plant Physiology 73 (1983): 582-85. Http://www.ncbi.nlm.nih.gov/pmc/articles/PMC1066511/pdf/plntphys00568-0068.pdf. Web. 29 Oct. 2014. Stafford, H. A., and F. A. Loewus. “The Fixation of C14O2 into Tartaric and Malic Acids of Excised Grape Leaves.” Plant Physiology 33.3 (1958): 194-99. Web. 29 Oct. 2014. Versari, A., G. P. Parpinello, and M. Cattaneo.”Leuconostoc oenos and malolactic fermentation in wine: A review.” Journal of Industrial Microbiology & Biotechnology 23 (1999): 447-455.